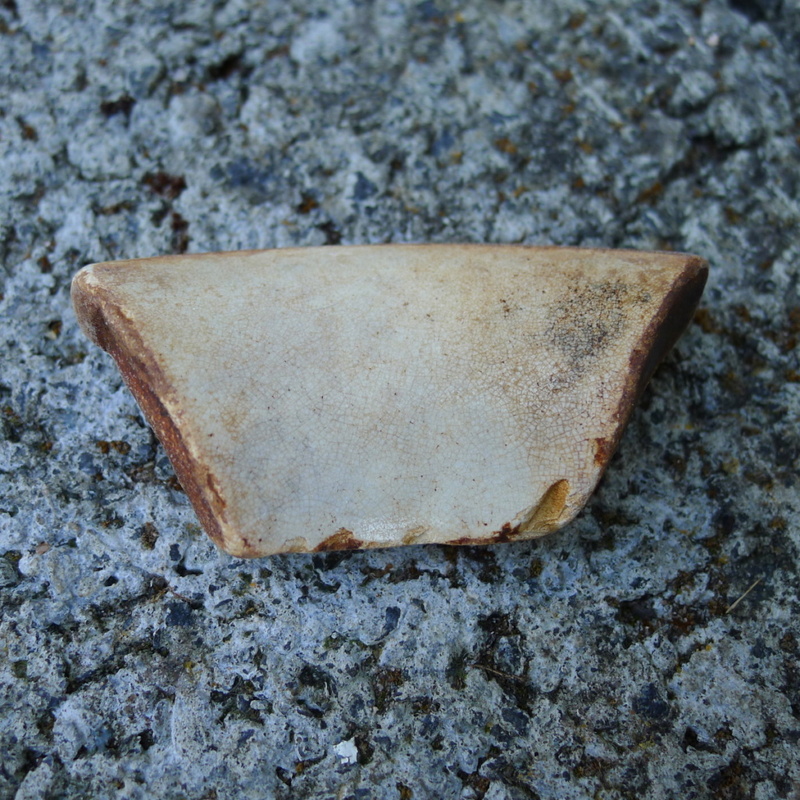 I found this piece of pottery on the beach in North Ayrshire, Scotland. I'm having trouble identifying an approximate age for it. The design looks hand painted and is relatively naive. I find a lot of 20th and 19th century pottery, but this does not fit in with the same aesthetic..
More photos would help. Is it a porringer? Cannot really quite tell. Base photo in particular. Gives some idea of clay used and some idea of the making. So its probably studio pottery. Crackle glaze porringer with what looks like a coarse stoneware clay. Now a porringer is rather a classic studio pottery form. Made very popular by being a staple item in the Bernard Leach St Ives standard ware. Many potters copied it especially in the boom which started in late 60's. So possibly 1970's? 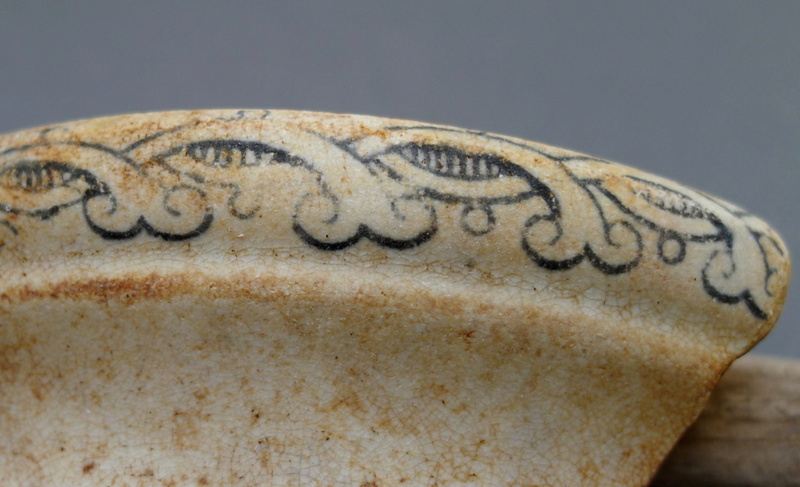 A crackle glaze would be unusual on a porringer. Its a classic Korean/Chinese glaze not really used by Potter's of the Leach school whose roots were very much in the Japanese tradition. What is that decoration meant to be tho? Scrolls? Arches? Classic calligraphic? If it is done by hand, it is has been done well. But again, unusual type of decoration to have on a studio porringer. Thanks for your insight - I'm not sure exactly of the design - looks like loops with scrolls? Each one is slightly different with more lines in the centre of the loop or the circle below the centre of each loop is in a different place. Some areas have heavier markings which is why I initially thought hand painted with the brush being harder to control quantity of paint. I’m going to disagree and say it’s from a post-1850 transfer printed staffordshire china plate. It’s possible it’s hand painted but you’d see a texture to the surface where the brush applied the cobalt, and I’m not seeing that. But if it is handpainted then I would date it to the early 1800s. Nothing about it is saying studio pottery to me. 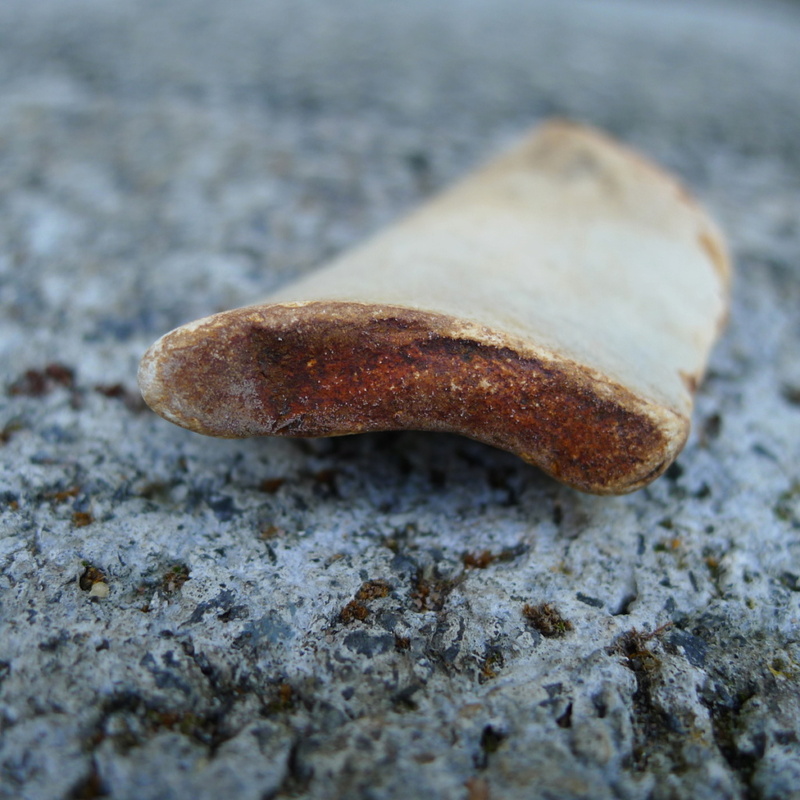 The staining is very common on shreds and not the true colour or texture of the original clay body. country pottery, could well be Scottish, might be worth showing it to a museum. Thanks for your input Naomi - I would agree about the staining on the fragments, some have brown staining, red etc while others come out perfectly clean. 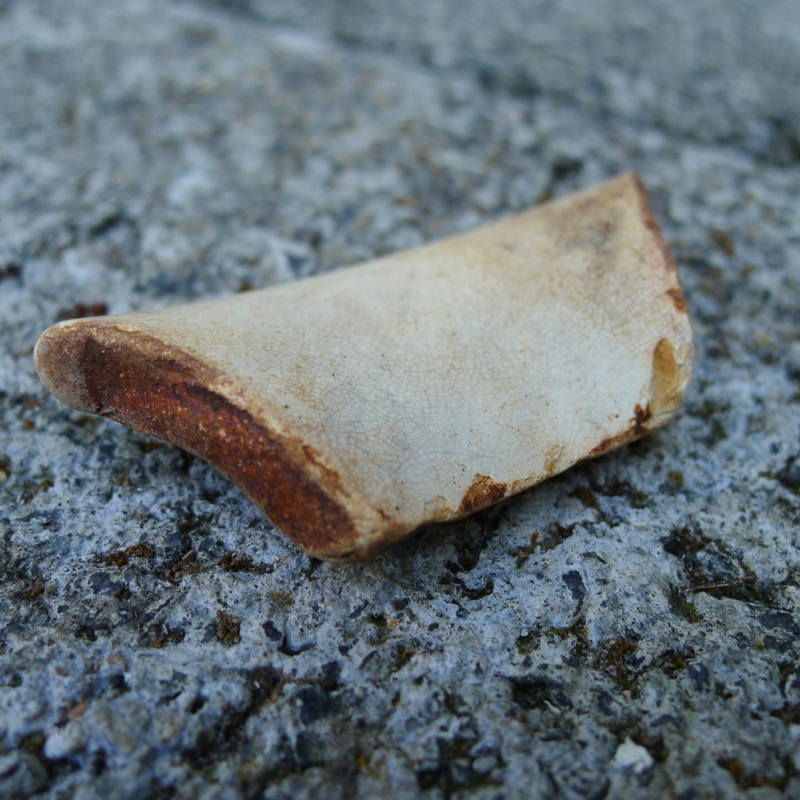 I'm pretty sure that most of the pieces I find are from a Victorian sea dump at the end of our beach. However it could have come from anywhere :) Perhaps it is not hand painted and is transfer printed.. I've noticed that the design is not straight and appears to be higher on the right hand side. Not sure if that is an indicator.. Interesting - another option to think about! different shapes, and one can almost see the brush strokes in the "grilles". If it was a transfer it might be a recorded pattern though. 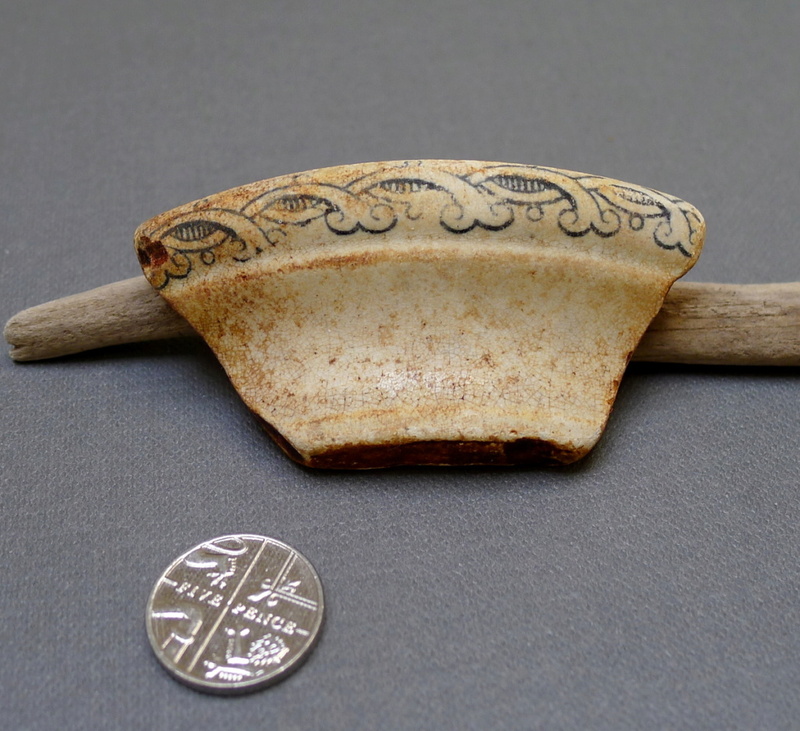 Could even be Delftware, with what looks like a thick tin-glaze over the body. 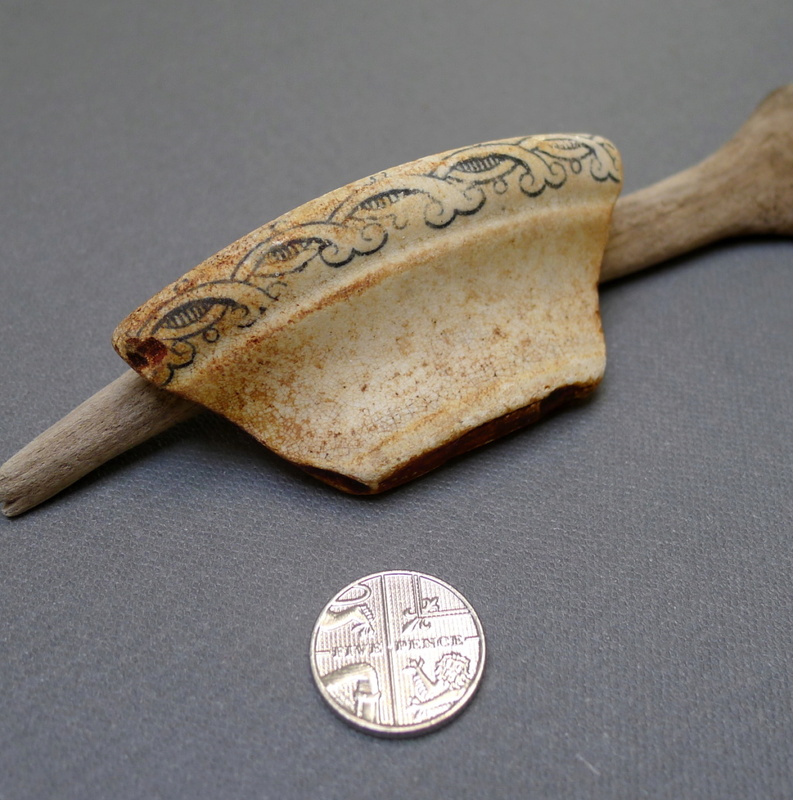 The design is very crude and there are a lot of inconsistencies - it's turning into a bit of a mystery :) Usually fragments I find are more elegant and can have very decorative well designed patterns on them - this just seemed a little bulky and almost naive in comparison.